In the debate of who the best basketball player of all-time is, there is no debate. It’s Michael Jordan. Jordan finished his NBA career averaging 30.1 points per game, (which is insane over the course of a 15 year career, especially when you consider he retired a few times and later came back) he amassed 6 championship rings, 5 NBA MVPs and 6 finals MVPs in his highly celebrated basketball career. And his accolades go on and on. Jordan wasn’t just a great player, he had an amazing work ethic, outlook on life and the ability to inspire and motivate millions of people around the world. So what kind of lessons can a trader learn from Jordan? Well here are 8 lessons about success that traders can learn from Michael Jordan. Probably one of the greatest lessons we can learn from Jordan is that if you want to be good at something, you need to work at it. Jordan was known for his hard work ethic. Michael Jordan worked extremely hard to reach every goal. Jordan was the first to admit that it wasn’t just his naturally gifted talent that made him so successful, it was his work ethic. Trading is not something you can just jump right into and start doing. You need to get educated first. You can’t blindly follow other trader’s advice and expect to be consistently profitable. If you are not able to dedicate the time necessary to study the markets and understand how to react to them, you will have trouble staying in the trading business. Jordan wasn’t always a winner. And we all know Jordan didn’t win every single game. The first time he got to the NBA playoffs, his Chicago Bulls were knocked out in the first round. The next two years, they were defeated by the Boston Celtics. After that, his team was beat by the Detroit Pistons three years in a row. I’ve missed more than 9,000 shots in my career. I’ve lost almost 300 games. Twenty-six times I’ve been trusted to take the game winning shot and missed. I’ve failed over, and over and over again in my life. And that is why I succeed. Jordan uttered those words in one of his most famous Nike commercials ever. Some of the best traders have failed. But, what sets them apart from others is they have learned from their failures and come back. As a trader, we can’t win in every trade. We all encounter loses. We all have failed trades. Traders need to learn from their mistakes and failures. Failure spawns growth. Embrace your setbacks and failures as fuel and motivation. Accept that failure is part of success. In another Jordan quote he says never try to skip over anything basic: “If you try to shortcut the game, then the game will shortcut you.” The message is great: if you try to cut corners or think you’re beyond doing something that seems basic then you will not be rewarded. To be a successful trader you need to have a trading plan and stick to it. And what’s in your trading plan are the fundamentals. All successful traders have trading plans so that they know exactly what they want to do when certain opportunities arise. The trading plan gives you the fundamentals on what you should be doing and if you stray from your trading style it will take your focus away from other setups that meet your trading criteria. Most of us are not, nor will we ever be, professional athletes. 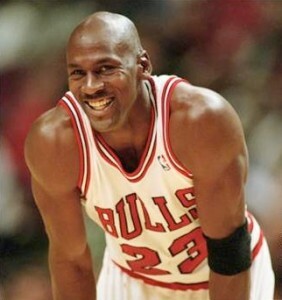 But Jordan’s off the court work ethic and attitude towards preparation transcends any profession. Jordan was a master at preparation. From the preparation leading up to game day to the mental preparation before. As a trader we need to prepare. This includes both mental preparation and putting in the time. For example a trader needs to create a watchlists and do research to find stocks that meet their trading criteria. Some of the best traders put in hours of daily research in finding great trade opportunities. They have their strategy all set, so when “game day” comes they are prepared to take advantage of opportunities. Also, a trader’s mindset needs to be clear and focused on what needs to be done. There shouldn’t be any outside distractions that can affect his or her ability. If success is to be yours, it will be yours while you are following your passion. You won’t succeed doing something you despise, you will only succeed when you do what you love, what you’re passionate about! All successful traders have a passion for trading. They can’t imagine doing anything else. To be a successful trader it demands loyalty and responsibility! Are you loyal to your duties, do you faithfully complete the critical tasks that are requisite to your success? Even though Jordan probably missed out on winning a few more championships during his time away, it was important that he listened to the voice in his head that was telling him to step away from the game of basketball. Doing this most likely helped him in the long run as he returned to the NBA refreshed in 1995 and promptly won three more championships. Even though you might be passionate about trading, for some traders there comes a time where they may need to step away for a bit to refresh themselves. This can mean stepping away for a short break for a few hours. 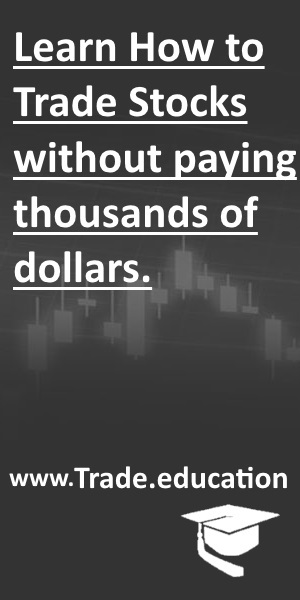 Or it can also mean stepping away from trading for a few days, a month or even a year. Stepping away for some time can do wonders to reinvigorate yourself. Jordan has been known for having extraordinary court vision and awareness. He always seemed to know exactly where everyone was on the court, the other players’ tendencies, and which plays would work against the different teams. His ability to anticipate and know what to do in certain situations is one of the factors that made him great. In trading you need to be conscious and aware trader. You need to know what stocks you are in and why you are in them. You need to monitor your positions you are in so you know when to lock in profits or to take a loss when you are in a losing trade. In the NBA, it is almost impossible to win every game. In the final match of a 7 game championship series, the winner of the game will have only won one more game than they’ve lost. 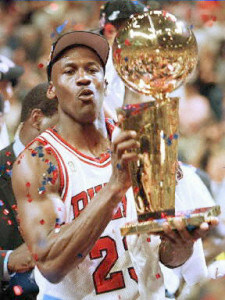 Jordan won alot of games throughout his career. He also lost games. In fact, his career winning percentage was 66%. As you can see he won more games then he lost, but his winning percentage isn’t as high as you might think it would be for someone with so many championships. Trading is somewhat similar you just need a few more wins than losses, and to go along with the proper money management you will be profitable. In trading everything will not always go your way. You will have both winning and losing trades. You need to learn to accept loses and learn from it. The key is to stick with your trading plan and along with the proper risk management you will come out ahead, and therefore you will come out a winner.